FORMER Manchester United legend Lee Sharpe visited Frome Town Football Club to hand over a cheque of £50,000 from The Football Pools on Wednesday 19th December. 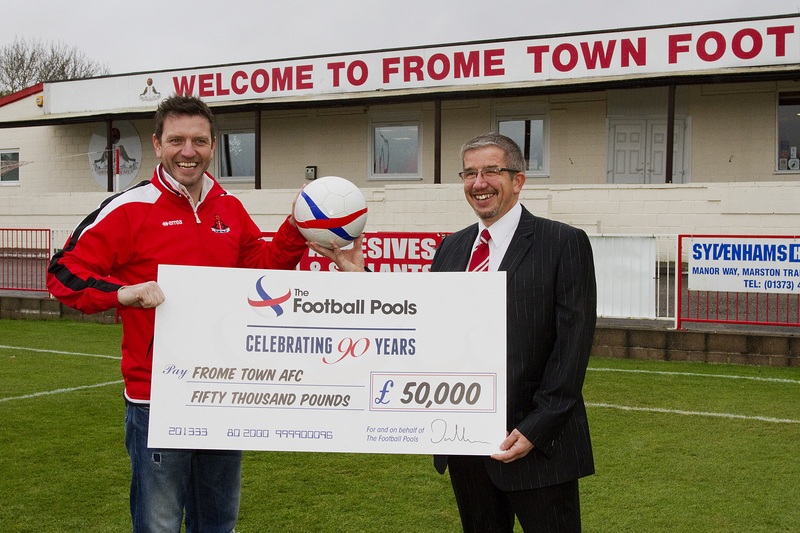 Lee, who has ties to the West Country through his time at Torquay United and Exeter City Football Clubs, was in Frome on behalf of The Football Pools to reward Gary Collinson, community development officer at Frome Town AFC, with the official cheque. Celebrating its 90th season in 2012/13, The Football Pools is the world’s oldest and most popular football gaming company and ran a national competition in November to find two UK football clubs deserving of winning a 90 day makeover costing up to £50,000. To enter, applicants stated clearly why they thought their club merited the £50,000 funding and demonstrated how this donation would be used for the good of the club. Frome Town AFC join St Helens Town Junior Football Club in Merseyside as the two winning clubs to have been selected by The Football Pools panelists Gordon Banks, Roger Hunt, Tony Green; Sportech director of corporate affairs, Richard Boardley and StreetGames chief executive Jane Ashworth. 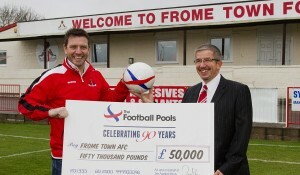 Founded in 1904, Frome Town AFC has had a significant input into football coaching across local primary schools. Outside of football, the club engages and accommodates other sports and activities including martial arts, disability classes, festivals, carnivals and charities. A delighted Gary commented, “On behalf of everyone involved with the club I would like to thank The Football Pools for this extremely generous award. “When I entered our application a month ago I did not dream that I would be standing here today with Lee Sharpe receiving this cheque. This club is so important to the community of Frome, not just our 20 football teams and 300 members but to our many other organisations. With this funding we can improve facilities, increase membership and continue to thrive as a football club. Richard Boardley, director of corporate affairs, Sportech added, “Over the last four decades, The Football Pools has donated hundreds of millions of pounds into the game and this latest programme will provide that essential lifeline for Frome Town AFC to re-build and modernise their facility. For more information on The Football Pools please contact: henry.robson@fasttrackagency.com – 07958 778244 or Jennifer.Danby@FootballPools.com – 07920 056636.